Visitors have a choice of three entrance times. Please be aware these times cannot be changed or swapped. Visit Queen Elizabeth II’s official London residence and discover two fascinating parts of Buckingham Palace. Enjoy a visit to the Royal Mews before entering the State Rooms and exploring inside Buckingham Palace. Your visit to Buckingham Palace begins with a look at the beautiful State vehicles in the Royal Mews. These recognisable vehicles are used for coronations, State visits, royal weddings, the State Opening of Parliament and official engagements. See the Gold State Coach, which has been used at every coronation from George IV onwards! It was also the vehicle of choice for the Queen’s Golden Jubilee in 2002. 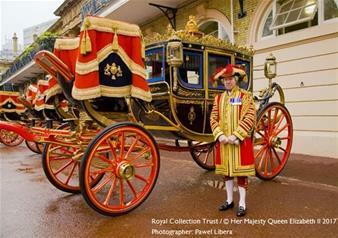 The Diamond Jubilee State Coach is the newest highlight to the Royal Mews. This stunning vehicle was built to celebrate the Queen’s Diamond Jubilee in 2012 and combines traditional craftsmanship with modern technology. During your visit to the Royal Mews, you may also see some working royal horses. After visiting the Royal Mews, please make your way to the State Rooms in time for your entry slot. A visit to the State Rooms at Buckingham Palace is a unique experience. Open to the public each year for a limited time only; the State Rooms give visitors a behind-the-scenes look into one of the world’s most famous residences. Members of the Royal Family use the State Rooms for official occasions and each of the 19 rooms is splendidly decorated. You can walk through the 47 metre-long Picture Gallery and view some of the greatest paintings in the Royal Collection! Here you will find paintings by artists such as Rembrandt, Rubens and Claude. Other rooms to visit include the beautiful ballroom and throne room. Experience the history and splendour of Buckingham Palace and reserve your tickets to guarantee a visit to this treasured Royal home. If booking the 11:15 entry, you will enter the Royal Mews at 10:15 and Buckingham Palace at 11:15. If booking the 13:15 entry, you will enter the Royal Mews at 12:15 and Buckingham Palace at 13:15. If booking the 15:15 entry, you will enter the Royal Mews at 14:15 and Buckingham Palace at 15:15. Once booked, your visit cannot be cancelled.